Influencer marketing as a term is being used copiously, particularly within the PR industry amongst B2C firms. However, many B2B brands are potentially missing a trick by not exploring or exploiting the influencer territory. After all, when most think of influencers, they think reality TV stars posting an Instagram picture showcasing the results of the latest teeth whitening kit – more of a PR move. Influencer marketing is identifying not only the macro influencers, but the micro influencers too, and building relationships with them in an organic way. 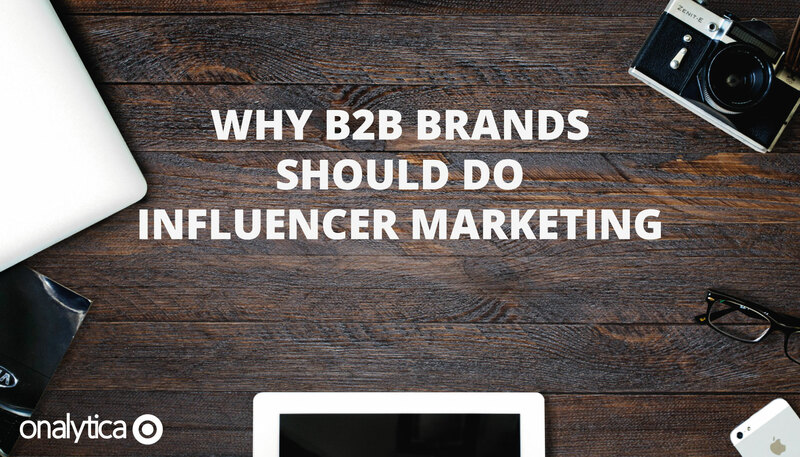 If anything, this is far more feasible in the B2B space, since those deemed influential, are more focused on building their influence in a niche area as opposed to reaping financial rewards. Here are some reasons why your B2B brand should implement influencer marketing into your digital strategy and what you can get out of it. Demand Gen’s B2B Buyer Behaviour Survey found that nearly two-thirds of buyers indicate that content had a significant influence on a decision. Most B2B brands do put a lot of time and emphasis on creating informative content, however, while writing the content is arguably the most important part, this doesn’t guarantee success. Today, in order for a piece to gain popularity, a domino effect must occur across social media in terms of likes and shares. However, a brand publishing content with no real strategy will find it very time consuming and often ineffective. The best way to achieve popularity is to know who the most influential people are in your field and build genuine relationships with them. This can provide opportunities for not only co-collaboration, but also promotion. Software solutions like our IRM (Influencer Relationship Management), will also enable content creators to promote their content amongst influencers, by entering the right conversations between the right people, in a way that is going to be most effective and opportunistic. Understanding this process and how your influencers work, will also enable you to create content using the kind of language that is likely to resonate, in turn increasing the likelihood of shares across social media. With many consumers and buyers turning to social media to fuel their opinion on a brand or product, it is more important than ever to ensure you have a presence as large as possible across social- not just for your sake, but to also keep up with and shut out competition. Ensure that your brand is on top of the rankings when someone searches for a topic relevant to your brand, from a combination of excellent content, influencers mentioning your brand and through organic on-topic tweets. In the Demand Gen’s B2B Buyer Behaviour Survey, 72% use social media to research a solution purchase and 57% connect directly with potential solution providers on social media. Therefore, having a presence on social media is more important than ever if you want to achieve success. As mentioned, the nitty gritty of all of this is that as a brand, you’re going to want to become more successful and sell more- the ultimate aim of every strategy. To achieve this you need to know exactly how you can sway B2B buyers- something that surprisingly enough influencer marketing can really aid with. 72% of B2B buyers look to industry peers to aid their decision process. In B2B, influencers will be defined as anyone whose opinion can affect the sales cycle, regardless of whether they actually have any real quantifiable power. After all, it isn’t always easy to relate to and trust a brand whose portrayal of themselves is understandable so very positive. An influencer comes with not only a sense of relatability and honesty, but also trust. In general, B2B buyers are using an increasing number of sources to aid in their purchase decisions, with social media being prevalent for 37% of buyers. Going back to my previous point of building your social channels, having a presence on social media can directly correlate to your position as a player in the market. A consumer making a decision about a brand wants to be able to make a relatively quick but rational choice- something that a scan through social media can help achieve. If you’re collaborating with influencers and posting content that is presenting you as an expert in a particular field, then this will bode well for any perceptions of your brand. This point brings all three previous points together- if you’re working with influencers to create content and to build your social channels, then you’re going to seem like a key top player, which is especially important for buyers. If you’re a marketer wanting to explore influencer marketing in time for 2017, why not trial out our influencer discover tool here?